TORONTO - For all the excuses and justifications made about hard-hit balls and line-drive outs, there is one certainty through the first third of the baseball season: The Red Sox have not scored enough runs to overcome their often-mediocre starting pitching. Though the pitching has improved recently - certainly from Josh Beckett, as well as Brad Penny - the offense has not. In their last five games, the Sox have scored no more than three runs. They rank sixth in the American League in runs per game (5.22), behind the Rays and Yankees, and 11th in runs per game on the road (4.27). It might be an offense built primarily for Fenway Park, but it must be able to take over the Metrodome, the Rogers Centre, Comerica Park, and so on. 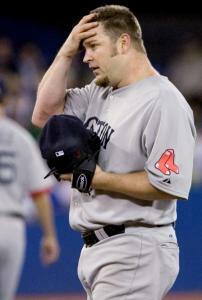 "Swing the bats better," Dustin Pedroia said, after the Sox didn't in a 5-3 loss to the Blue Jays in front of 35,484. "I think we got three hits today, or whatever it was [four]. "We need to find a way to score runs, because we're not winning many games. We need to start. It's not early anymore. We've played 50 games. So we need to start doing things offensively." "The one thing I think when you are struggling is - when you get two-out hits it can mask a couple days where everybody's sort of swinging the bat [just] OK," manager Terry Francona said. "[Friday] night we had hits. When we hit into a double play or we don't get a two-out hit, that makes a four- or five-day span a little more glaring." The Sox have not been able to convert lately, especially since Francona switched the lineup. Before the change, the Sox scored six and won against the Twins without David Ortiz. After that, with Ortiz in the sixth spot, the Sox have lost four of five and have scored just 13 runs. They have made stars of average pitchers, from Nick Blackburn and Kevin Slowey to Casey Janssen and, yesterday, Brian Tallet. There was another oddity once Penny left the game, too. Ramon Ramirez, who has been outstanding, struggled for the first time with the Sox. He had allowed just two earned runs this season, but he matched that yesterday. With the game tied at 3-3 in the seventh, he allowed three hits and intentionally walked a batter before exiting. "That's one of the first tough innings we've seen," Francona said of Ramirez. "He just looked like he was having a hard time. His body language. Just looked like he was out of synch. "You never want it to happen, but you're not going to go all year and be perfect. That's just the way this game is." Marco Scutaro hit an infield single to start the inning, the throw from shortstop Nick Green pulling Kevin Youkilis off the bag. Scutaro advanced on a wild pitch, and was driven in by an Alex Rios single. Vernon Wells doubled home Rios before Ramirez walked Adam Lind, induced a fly out, and was taken out. Penny performed adequately, as he has save for two bad starts. "I left too many fastballs running back over the plate," he said. "It wasn't a bad outing, but seems like every mistake I made they hit." For past Sox teams, that wouldn't have been a problem. Allowing three runs early, and two more later, would just have been fodder for a comeback. But these Sox - especially on the road - seem to require far better performances from their starters. From Ortiz on down, the hitters need to get those hits to drop and blast those line drives to the gaps when away from home. "The players we have, not everybody, but a lot of them are suited for Fenway," Francona said. "There's guys on our club, they know they can reach out and hook something, hit it off that Wall. "On these road games, you can go out and hook it and fly out. There's a difference. That's one reason. It's been something we've been trying to figure out for a while. "Home and road, there's a lot of disparity. I would hope we can figure it out by tomorrow."